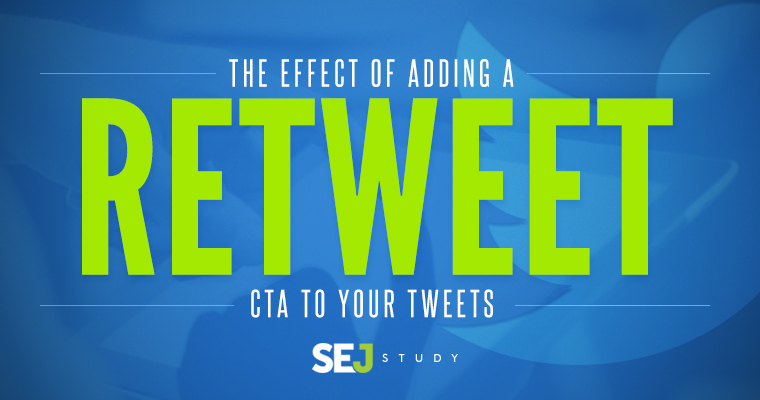 What is The Effect of Adding a "Retweet" CTA to Your Tweets? 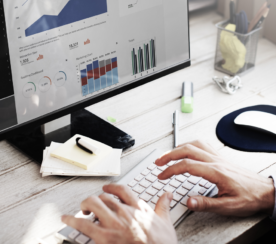 As marketers and business owners, we’ve all heard or read about the importance of adding calls-to-action on our content, but many are less informed when it comes to the specifics of those CTAs. While there is an abundance of information available recommending testing the text, colors, and placements of our CTAs on our websites and blogs, there is less information surrounding using CTAs on social media sites like Twitter. 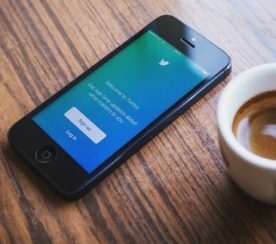 With only 140 characters to get your message across, add your destination link, include the appropriate Twitter handles and hashtags, is it still worth trying to squeeze a call-to-action into your tweets? These are the questions SEJ set out to answer in its latest independent study. 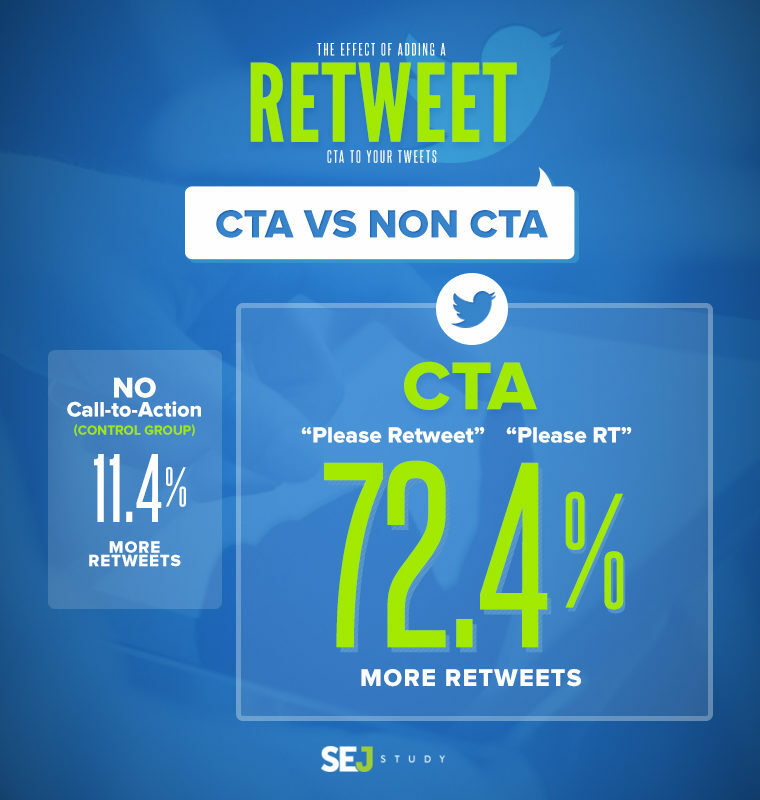 Specifically, will a “retweet” CTA increase reader engagement (measured in retweets)? If so, which CTA is most effective? Overall, 585 (11.4%) of the updates received at least one retweet, for a total of 976 retweets. 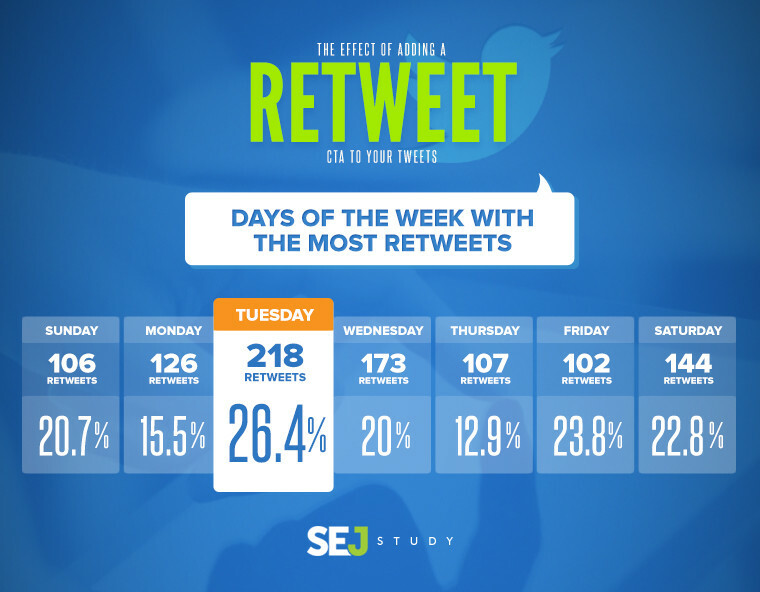 However, the updates that included the ‘retweet’ CTAs collected 72.5% of all retweets. The results show again the importance of testing. Although both CTAs kindly ask the reader to retweet the message, there ended up being a significant difference in their effectiveness. 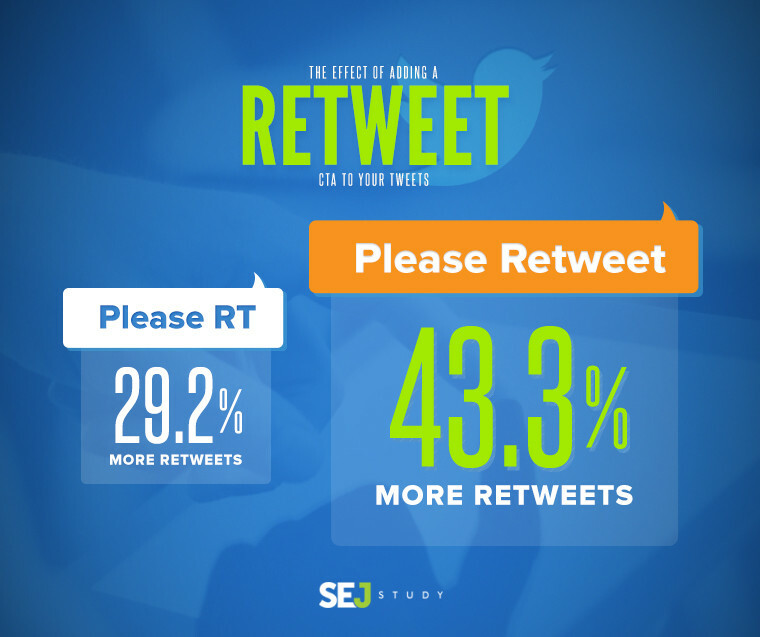 While the ‘Please RT’ message accounted for 29.2% of all retweets (285), the fully written out ‘Please Retweet’ was responsible for 43.3% of all retweets. 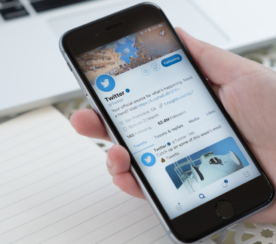 In a separate study, Twitter found that in ‘Promoted Tweets’, it was also more effective to ask for the Retweet at the beginning of the tweet. According to our data, readers were more engaged on Tuesday (26.4% of tweets were retweeted) than on any other day of the week. Wednesday (20%), Friday (23.8%) and Saturday (22.8%) also showed stronger than average engagement. Our data may be skewed slightly lower than actual results for a regular or active users. Of the 22 Twitter accounts we watched, a couple were less active accounts and tended to get fewer retweets as a result of that (although one could argue that makes this a more accurate representation, as well). Although not part of the study, intuitively it would seem that the positive results would diminish over time if you added a ‘Please Retweet’ to every tweet. Has anyone experienced this? Our data does indicate that a ‘Retweet’ Call-to-Action will affect follower engagement and result in more retweets. I recommend using it sparingly – for an important event or product announcements, or the publication of a big article – allotting the 15 spaces required to write ‘Please Retweet’ out completely at the beginning of the update, and for best results, add it to your tweets during mid-week or heading into the weekend. Have you found Twitter calls-to-action be effective in increasing retweets? What other CTAs have you tried on Twitter? This study was conducted by the team at Kairay Media, an online marketing company founded by our Chief Social Media Strategist, Brent Csutoras. Screenshot by Brent Carnduff. Taken January 2016.